Material for parlor and stage, easy to do and very strong. You can create one or two complete acts from this. BROKEN HEART (Edwin Hooper): Two selected cards. You reveal one with a plastic heart, then you crack the heart apart to reveal the second one with a card silk. STAGE PRESENCE (Aldo Colombini): Uses jumbo cards and with these cards you reveal a mentally selected card. JUMBO (Aldo Colombini): You make a kind of airplane with the deck and at the end you reveal a selected card (that falls from the airplane!) and the four Aces. WEIGHT GUESS (Tom Hubbard): A spectator cuts a packet of cards, you reveal how many cards by weighing them. A MENTAL EFFECT (Marconick): A deck is shuffled by a spectator and nine cards are placed into glasses. The spectator eliminates all the cards but one. You predicted that card. HERE’S LOOKING AT YOU (Karrell Fox): Great effect where you throw the deck into a paper bag and a spectator finds the first spectators selection inside the bag. COUNT ON THEM (Aldo Colombini): A three-card repeat routine. At the end, only one card remains: The selected one. 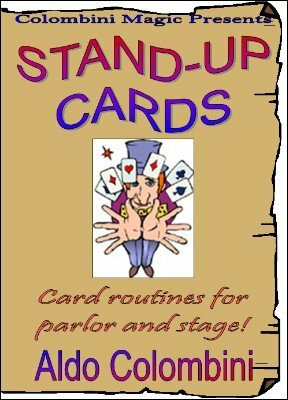 MIND READING PAST AND PRESENT (Ken de Courcy): A commercial routine where a spectator cuts the deck under a handkerchief and takes three cards. You reveal them by reading his mind in three different ways. GET OFF MY SPREAD (Aldo Colombini): A thought-of card vanishes from a packet of cards and re-appears in the pocket. You repeat the same thing using jumbo cards. HOUDINI CARD (Tom Daugherty): A signed card is replaced. You wrap the deck with two rubber bands, a piece of aluminum foil and a handkerchief; yet, you remove the card and the deck is still wrapped. It will blow your mind.